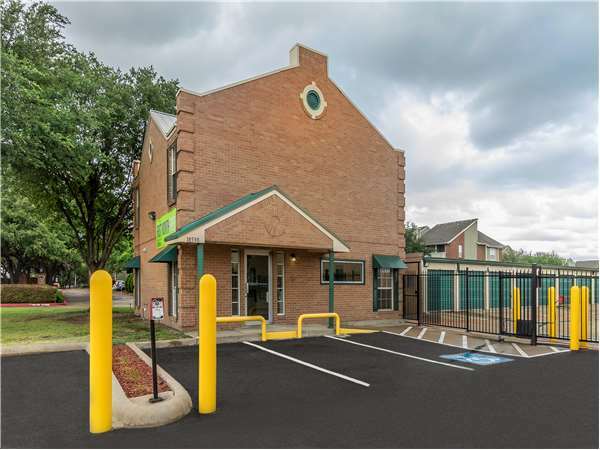 Located on Dallas Pkwy just north of Frankford Rd, Extra Space Storage serves Dallas residents near Far North Dallas, Addison, Carrollton, Hebron, and Plano. Locals will recognize our facility next to Extended Stay America Hotel north of Albertsons and Jack in the Box. We're also accessible for residents of nearby apartments and condos, such as Pear Ridge Apartments, Parkway Lane Condominiums, Sutton Place Apartment Homes, The Verandas at Timberglen, Creekside Apartments, and La Salle. Do you need a storage unit close to the airport? Extra Space Storage in Far North Dallas is about 3.5 miles from Addison Airport, making us a convenient option for residents and visitors who need safe storage. Extra Space Storage on Dallas Pkwy offers a large selection of storage units, climate-controlled storage units, drive-up access, and exceptional security. We're your storage partner in Far North Dallas! With unit sizes ranging from 5x5 to 10x35 and convenient features like indoor access, drive-up access, and elevator access, our Dallas storage facility can handle practically any storage need you have! Our Dallas Pkwy storage facility utilizes advanced security features like 24-hour video surveillance, electronic gate access, and an on-site resident manager, providing peace of mind for customers. Concerned about storing temperature-sensitive items? Climate control keeps your unit safely between 55 and 80° year-round, protecting belongings from Dallas' heat and humidity. Climate-controlled units are available in sizes 5x5 to 10x35. Want to avoid the hassle of carrying heavy items down hallways or up a flight of stairs? With drive-up access, you can pull a vehicle up next to your unit to quickly unload and load your belongings. Some units may even be used for garage-like vehicle storage. Drive-up units are available in sizes 5x5 to 10x30. When you rent with Extra Space Storage, you can expect reliable self storage with excellent service. We keep our facility clean, well-maintained, and secure at all times, and our friendly, professional staff of storage experts is available to answer your questions or help you find the perfect storage solution. Contact us to reserve a storage unit in Dallas today! The staff are very friendly and attentive. My unit is very spacious and convenient. I also love the first month free promotion that I received. Alexa was of great help all through the move in. This place is great- large selection of storage units. Fantastic service. Great prices. Our second experience with Extra Space. Extra Space has good security, good sized spaces to rent, and the staff is really friendly. In my opinion, you won't go wrong in renting space from them. Great customer service and easy process of renting a unit. Stephanie made the decision process easy by showing me all of my options & accommodating my changing schedule. The facilities are clean & secure, with climate controlled options and great pricing. Extra Space Storage is a clean and neat place to leave your personal items. Customer service is excellent and can answer all your questions. Property is kept up and secure. Location is easy to get to and gates are in good condition. The storage is clean and well lighted. Staff really nice. The staff is friendly, courteous and responsive to all my needs. Highly recommend. I rent a climate controlled 10' x 10' space here and have been very satisfied with the condition of the property and the unit. Customer service has been excellent and I would encourage anyone who needs extra space to rent here. I love this location. It's clean and the staff is awesome. I like to pay online, and when I first signed up to do so, I got the reminder emails. For whatever reason, I no longer get them. This is frustrating because I might as well get the paper bill if I'm not going to get the reminder email. I still get the payment confirmation email without problem. The local facililty doesn't really know anything about website issues and I don't know who else to report it to. The facility that I use is very conviently located on Dallas N. Tollway. The biggest part of your company's awesomness is your PEOPLE! Your staff is VERY friendly and helpful. I've stored with others like UHAUL, but I've found my favorite! Thank you all. Business set up is designed to meet customer needs on all levels. After researching other storage facilities, this one beat them hands down! Just past Extended Stay America Hotel on the Northbound Service road/Dallas North Tollway and Frankford Road. Drive south on Dallas North Tollway. Take the Frankford Rd exit and merge onto Dallas Pkwy. Turn left onto Dallas Pkwy. Our facility will be on the right after Old Bent Tree Ln. Drive north on Dallas North Tollway. Take the Frankford Rd exit and merge onto Dallas Pkwy. Pass CVS and continue straight. Our facility will be onto the right after Old Bent Tree Ln. Drive west on Frankford Rd. Cross Preston Rd and continue straight. Turn right onto Pear Ridge Dr. Turn left onto Old Bent Tree Ln. Turn right onto Dallas Pkwy and our facility will be on the right. Drive east on Frankford Rd. Pass Dan F. Long Middle School and continue straight. Cross Dallas North Tollway and turn left onto Dallas Pkwy. Our facility will be onto the right after Old Bent Tree Ln.